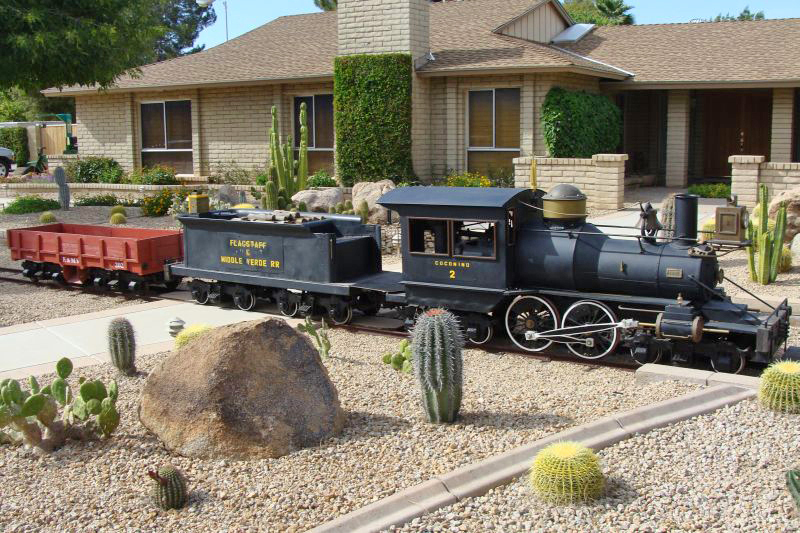 The Arizona and Pacific Railroad is a project of John Sayre (with help from my brother David) located in Peoria, Arizona a rapidly growing suburb northwest of Phoenix. The current line consists of approximately 700 feet of mainline and over 1000 feet of sidetracks that travel among fruit trees and gardens and past our brick observation patios. We have ten switches, one crossing signal, five trestles, water tank, gallows style turntable, transfer table, one-stall engine house and a three-stall engine house currently in place. We are 16 inch gauge and utilize 12 pound rail throughout our railroad. Some of our structures like the engine houses, steps and platforms are built to human scale; the water tank, turntable, lamp posts and others are built to 5/12ths narrow gauge scale. Custom lamp posts are spaced throughout the property and provide a “period look” for night time operation. 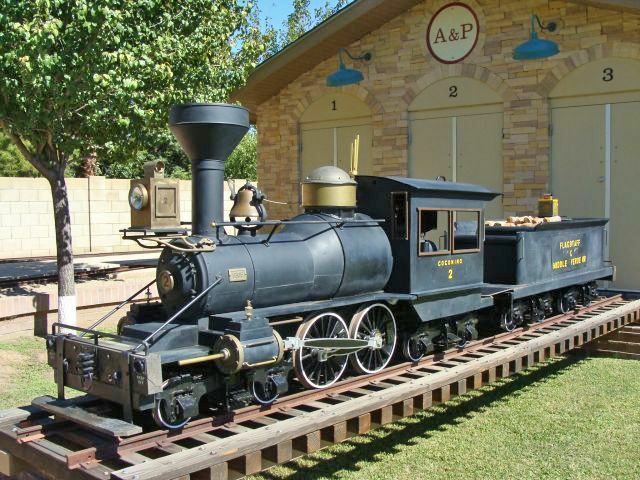 The A & P RR can trace its origins to a Fall day in 1994 when the Sayre Bros. attended a rare open house at the Flagstaff and Middle Verde Railroad of Malcolm and Martha Mackey in Camp Verde, Arizona and "got hooked" on Allan Herschell and Miniature Train Company equipment and its operation. We purchased our first significant piece of equipment in May of the following year. 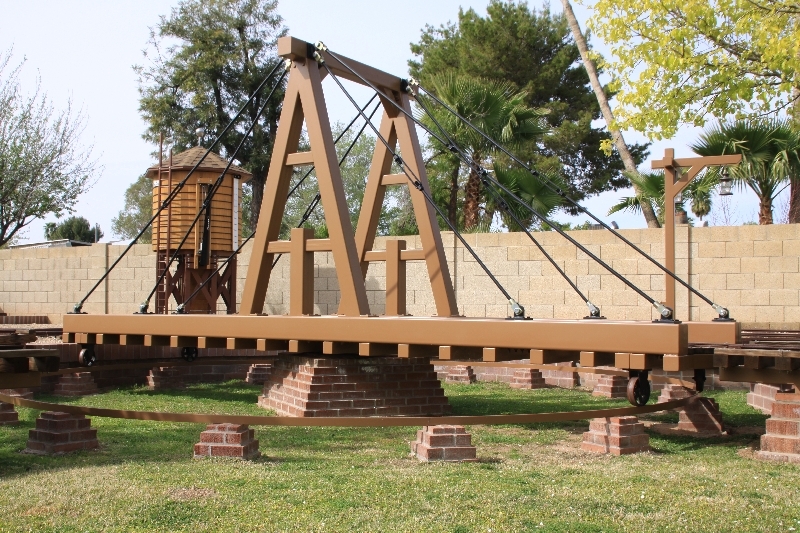 The three stall engine house was recently completed and is covered with stone native to northern Arizona. 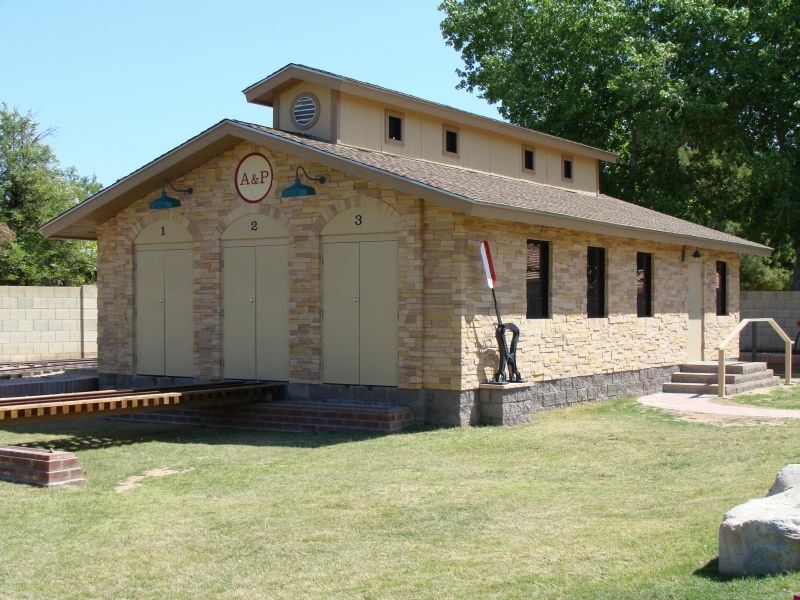 The structure is designed to have the look and feel of a turn of the century narrow gauge railroad structure that might have stood along the rail in turn-of-the-century Colorado. In addition to the three engines, the structure houses several displays of Allan Herschell and Miniature Train Company collectibles. 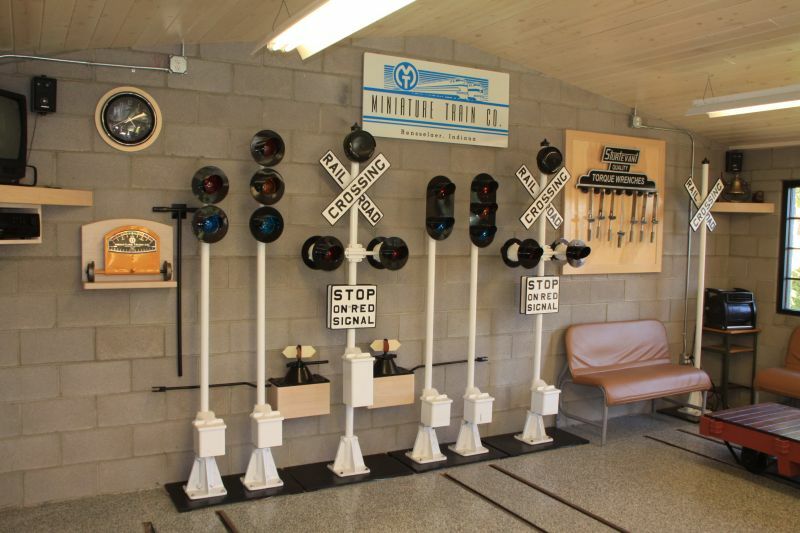 Among the many displays are vintage catalogs and photographs, restored MTC crossing signals, block signals, cross bucks, right and left hand switch stands, a MTC track gauge and too many more items to mention. MTC G-12 No. 377 will eventually be displayed in the main engine house as well. 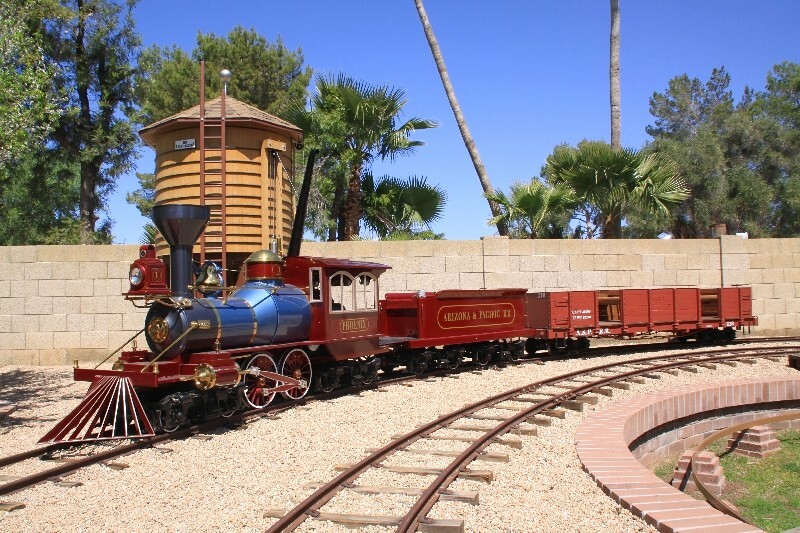 We currently have six engines at Arizona and Pacific Railroad. Engine No. 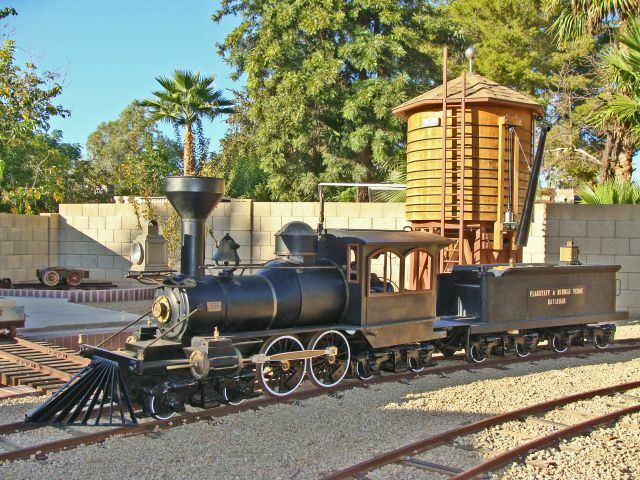 1 of the A & P RR, the "Phoenix",was our first engine and remains the workhorse of the railroad. 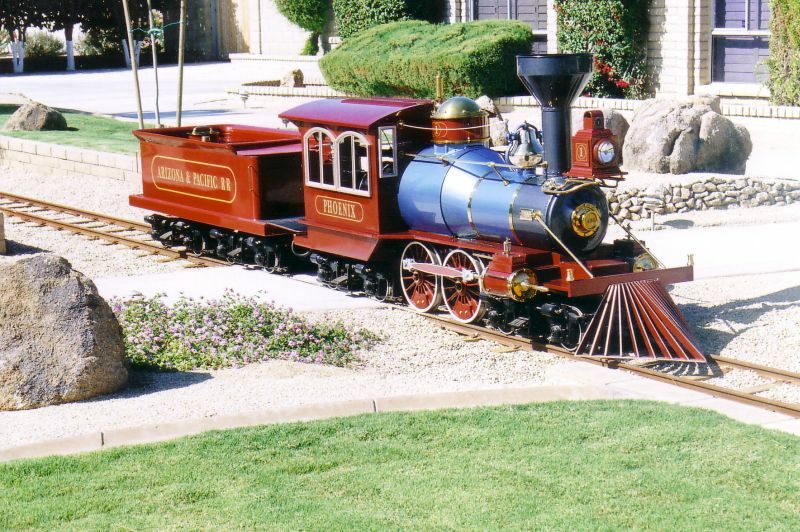 It was originally purchased by Del Webb (1959) and operated at his HiWay House Hotel and convention center in Phoenix. The history of the engine can be found here. The “Sandusky” engine (No. 2) was one of two S-16s that originally operated at Cedar Point Amusement Park in Sandusky, Ohio. We acquired that engine in 1996. The history of the engine can be found here. The “Bumble Bee” engine (No. 37) originally operated at the base of a ski resort in Red River, New Mexico (near Taos). The engine and tender sheet metal have been modified to have the feel of the Denver and Rio Grande “Bumble Bee” engines popular in the 1950s. The history of the engine can be found here. The Tucson was installed at the Del Webb HiWay House Hotel and convention center in Tucson, Arizona in January of 1960. It later became the first engine at the Flagstaff and Middle Verde Railroad. The history of the Tucson engine can be found here. 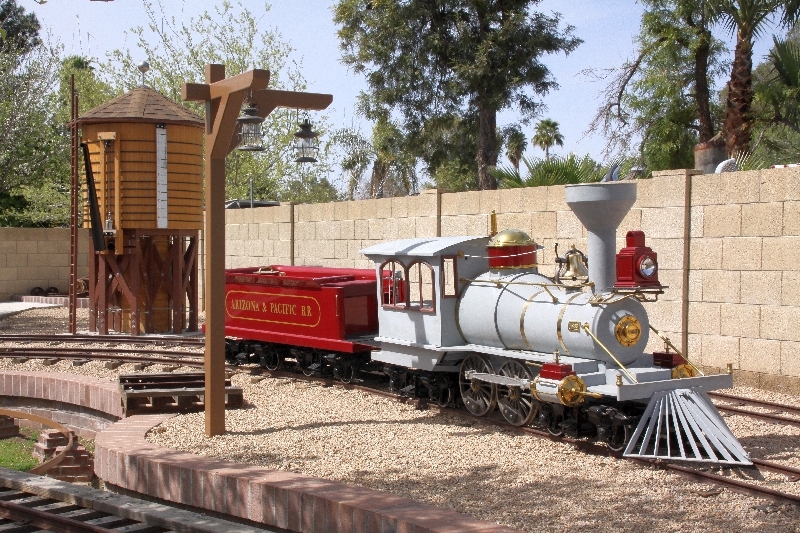 The Coconino originally operated at Playland Amusement Park in Rye, NY and underwent major restoration at the Flagstaff and Middle Verde Railroad. The history of the Coconino can be found here. Our G-16, No. 582, first operated in Indianapolis at the short-lived Little America Amusement Park. It was originally shipped on October 29, 1951. The history of the engine can be found here. We pay tremendous attention to detail in the contruction or restoration of each one of our projects and as a result our projects don't get completed as quickly as those of some other enthusiasts. We are, however, very pleased as are others with the finished projects. 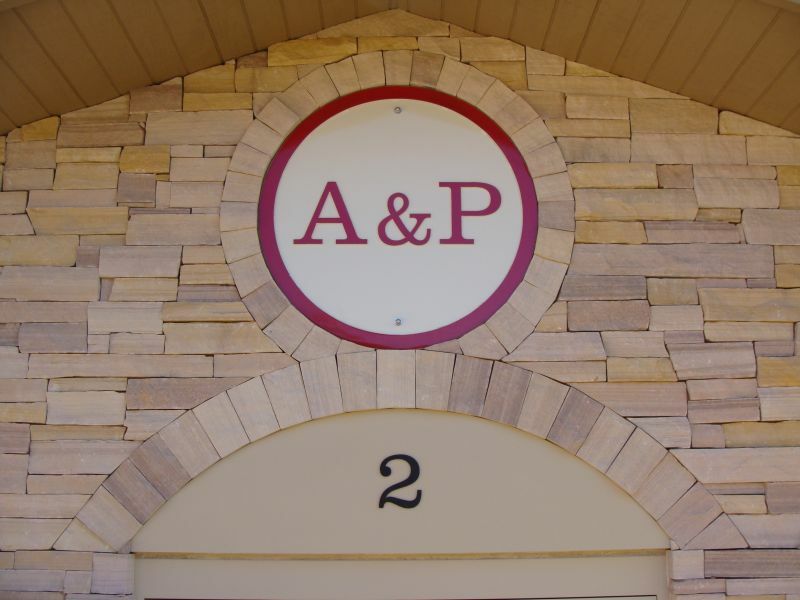 We hope you enjoy some of our before and after photos as well as our construction photographs. We are a private railroad and not open to the public or drop-in guests. Working a 50+ hour a week job necessitates that policy. Requests in advance to visit by other park train enthusiasts are welcome when schedules permit. 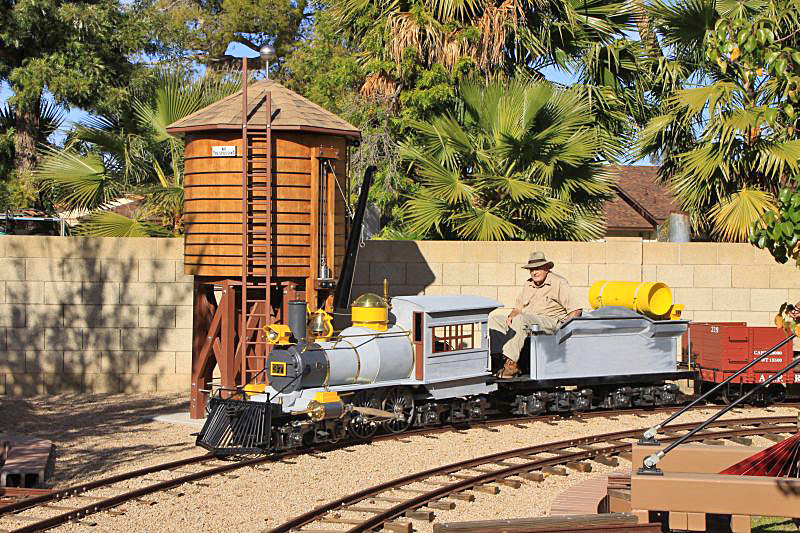 What's been accomplished at the Arizona & Pacific Railroad this year? 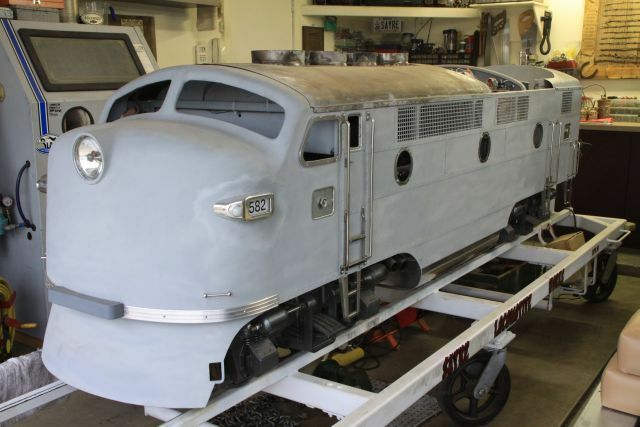 See photos of the restoration work performed on equipment of the A&P RR. 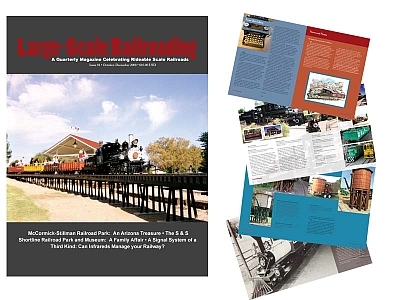 Articles and photos of miniature railroads in the state of Arizona. 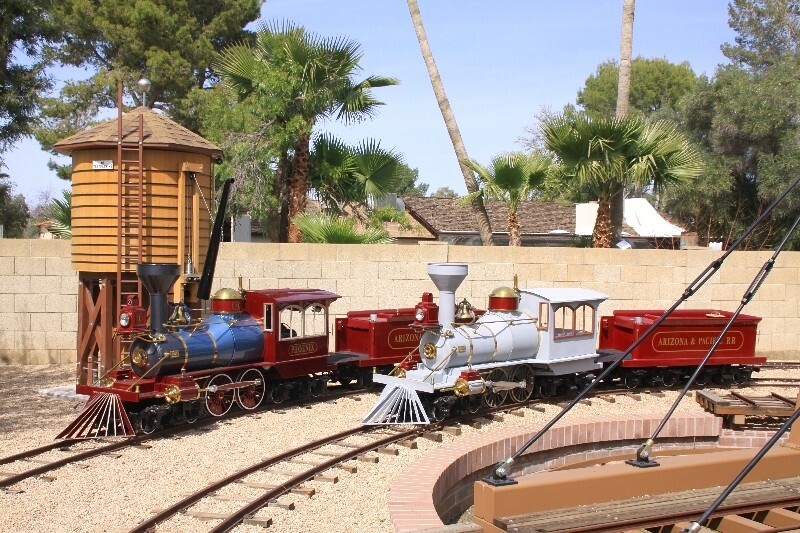 Periodically we will spotlight another miniature railroad outside of Arizona that we got the opportunity to visit. In April of 2008 we became aware that one of you had nominated us for the Discover Live Steam/Bitter Creek Western Website Excellence award. We appreciate the nomination and the support of those of you who visit our site on a regular basis. May 2nd we were notified the ballots were in and been counted, there were no hanging chads, and we were named the winner of the “individual” division. Thank you to whoever nominated us and to all the people who voted for us. 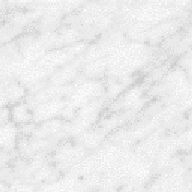 We will try to keep the website fresh and expanding and interesting in the months and years ahead. Thank you again for the honor and your viewership. Another beautiful day for railroading!